An Ambassador of Dolphins between People. Have you seen a dolphin? The Northern Adriatic Sea is home to a considerable number of vertebrates (whales, dolphins, sea turtles and sharks); few people are fully aware of its biological richness. Although the Adriatic Sea represents a relatively small area, a number of institutions and societies carry out scientific research by collecting data and recording encounters and strandings along its coasts. AdriaWatch was a scientific observatory for large marine vertebrates of the Northern Adriatic Sea, where Vivamar continues the initiative. They collected data about sightings and strandings of dolphins and whales, sea turtles, and sharks along our coasts to acquire knowledge about the health status of the Northern Adriatic and its marine ecosystem and to disseminate the information among the public. The results indicate that more strandings were found along the Italian coast than the east side of the Adriatic Sea. This is most likely because of surface marine currents. The main current coming into the Adriatic Sea at the strait of Otranto in the south is entering on its eastern side. It then splits into three major sub-currents: west off the island Mljet, south-west from the island Mali Lošinj, and south off the tip of Istria peninsula, Cape Kamenjak. All currents turn westward to the Italian coast and flow back to the south all along it. We also see a higher number of strandings of the loggerhead sea turtles (Caretta caretta) south of the islands of Mali Lošinj and west of Dugi Otok. The main marine current at this geographical latitude splits into several weaker ones, where one is directed eastward towards the coast. 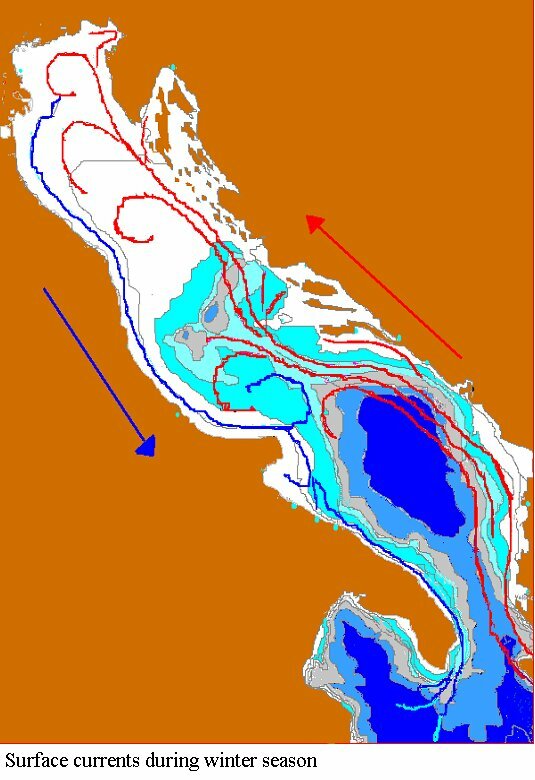 It is important to note that the Adriatic surface marine currents are a bit different between the seasons. For more see here. Another example of a species that is stranding more often in the western Adriatic due to marine currents is sperm whales. 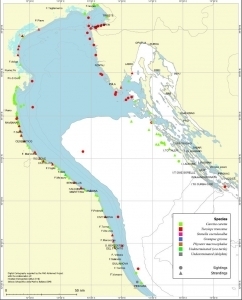 Multiple sperm whales were found in September 2014 near Vasto in Italy. Only a week before this event, the animals were seen alive in Croatia at the same geographic latitude in the southern Adriatic and, most likely due to exhaustion, drifted with the current to the Italian coast. AdriaWatch was strongly focused on providing information to the common public and raising general awareness of these important species of our marine environment. It was a successful joint European INTERREG project where data collected from Slovenia, Italy and Croatia was pooled together into one single database, thereby facilitating a better understanding of the multi-national problems affecting the inhabitants of the area. spreading the importance of conservation of large marine vertebrates in our Adriatic sea. We welcome your observations and active participation in the maintenance of a healthy Adriatic Sea! For more see ADRIAWATCH ter na FONDAZIONE CETACEA. 'Long live the Sea!' For the Dolphins. For the Environment. For us! The Quest for a Dolphin Education Center! Zaupajte nam e-naslov in ostanite obveščeni!